Too hot to cook? This chilled rice salad will save the day. Perfect for potlucks or family gatherings, this super side salad is easy and delicious. COMBINE Miracle Whip with soy sauce, garlic and lime juice. 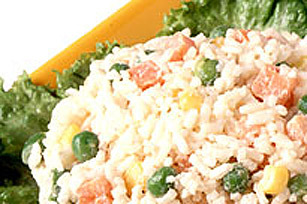 TOSS dressing mixture with rice and vegetables.